Ever since we stayed in Bangkok, first in 2016 and again in 2017, we always wanted to visit Ayutthaya, the ancient capital but never had the opportunity. Ayutthaya is located about 80 km north of Bangkok and is a very popular destination with tourists. Many of the tours offered are large organized trips with masses of people on a bus, exactly the kind of experience we abhor. 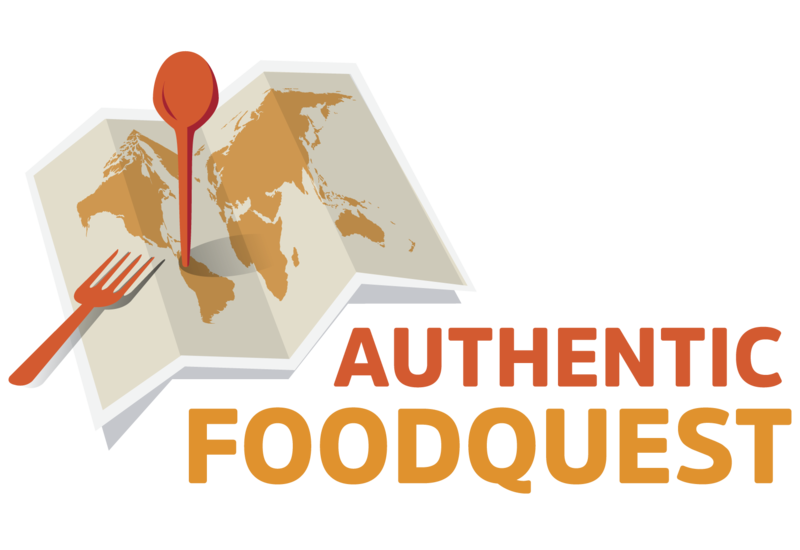 At Authentic Food Quest, we seek travel experiences that are local and intimate. We also look for guides who are native to the region and who can share insights and history about the local culture. When we discovered the TakeMeTour website, which has Thailand’s largest selection of local experiences, we were ecstatic. On the TakeMeTour website, we found the perfect Ayutthaya day tour that combines a visit to the former capital and the local food specialties. 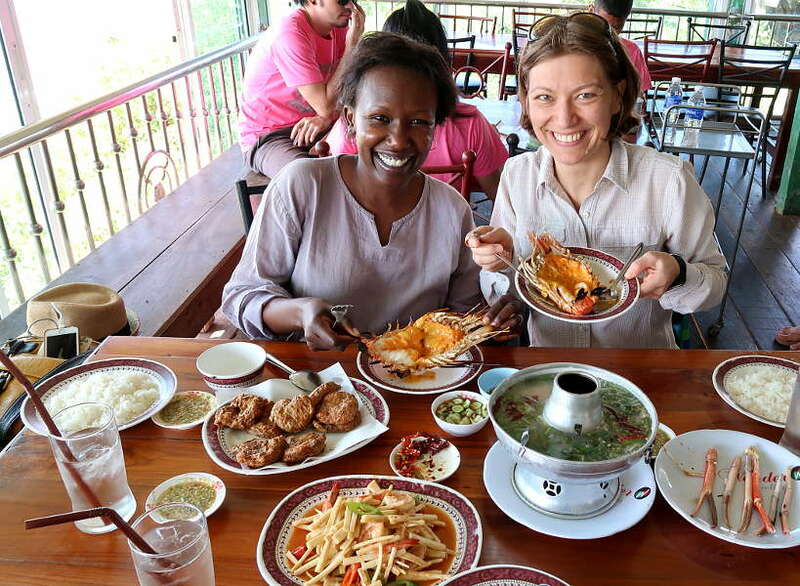 Join us for tasty Ayutthaya day trip and giant grilled shrimp. 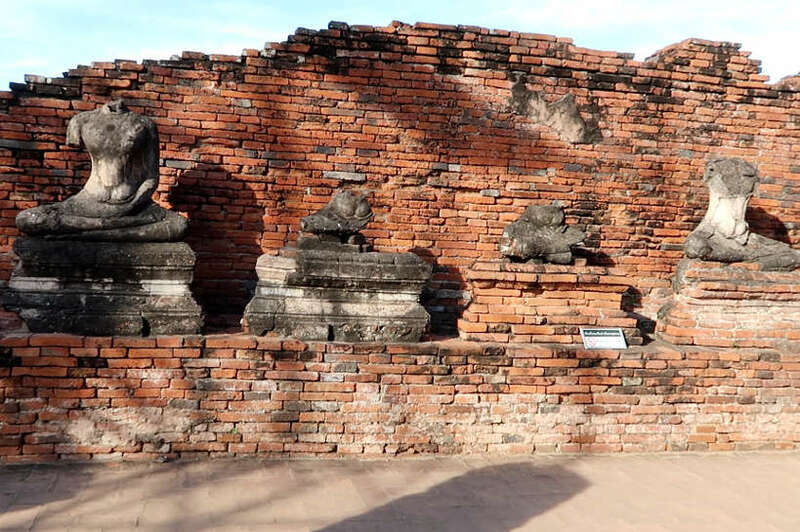 Click to see our Ayutthaya Tour From Bangkok video. 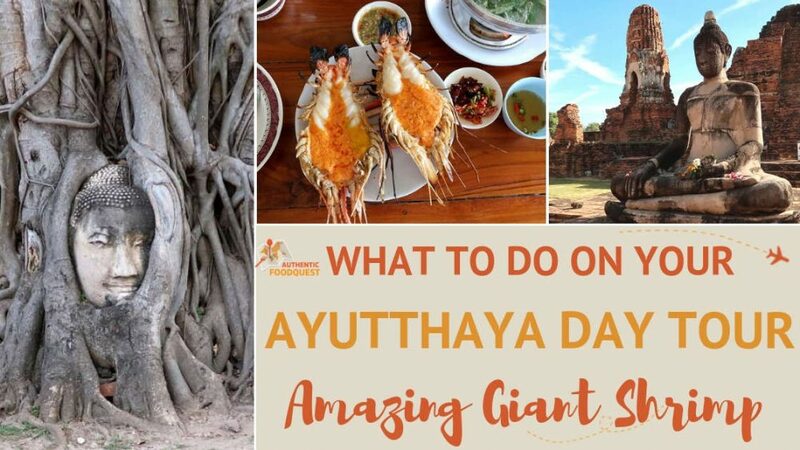 Imagine visiting Ayutthaya and then eating giant shrimp. Once we saw the Ayutthaya: The Biggest Buddha, Giant Grilled Shrimp and Thai-Chinese Market tour, we were sold. it was a no-brainer to have a local expert guide us on this tour. 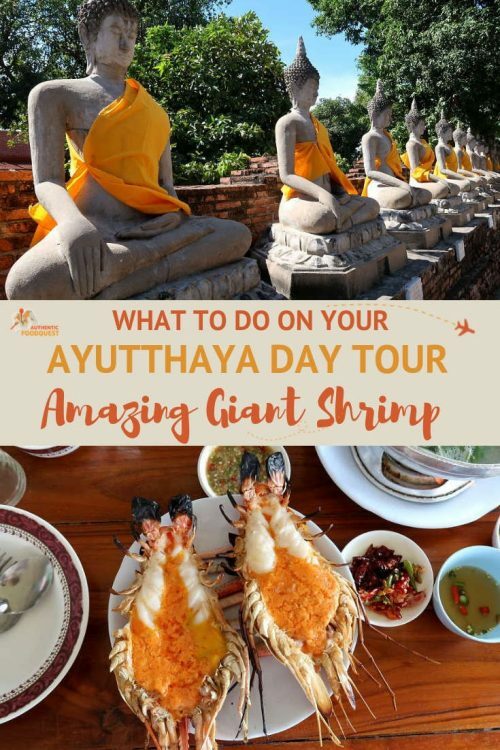 As excited as we were about finally visiting Ayutthaya, the tantalizing experience of eating giant shrimp had us salivating from the start. Having a local guide makes for a richer experience. All tours on the TakeMeTour website are led by local experts. Aaron, who also goes by Non, an English speaking, Bangkok native, was our tour guide for the day. The tour began with a 7:00 am pick up at our hotel, At Residence Suvarnabhumi. Over an 8-hour period, we visited four temples in the historic city of Ayutthaya. We also stopped at an old Thai-Chinese local market and ended the day eating the famous local giant grilled shrimp. All in all, we passed through three of the 77 provinces of Thailand, learning about the local history and culture at each stop. Ayutthaya was once the biggest city in the world. Founded around 1350 by King Ramathibodi, Ayutthaya became the second capital of Siam (Thailand’s former name) after Sukhothai. Ayutthaya came to prominence after the fall of Angkor Wat in Cambodia, taking its place as Southeast Asia’s hub of global diplomacy and commerce. The royal court at Ayutthaya regularly welcomed merchants and traders from the world over, including China, Japan, India, Portugal, France, and the Netherlands. Upon seeing the golden temples and stone statues within the Royal Palace, many merchants from the west proclaimed Ayutthaya to be the most beautiful city in the world, even rivaling the great monuments and architecture of Rome and Venice. A long war fought between the Kingdom of Ayutthaya and its main rival, the Kingdom of Burma eventually took a toll on the city. In 1767, the Burmese army invaded Ayutthaya, stripped it of its gold and burned the temples to the ground. What remains now are magnificent ruins of former splendor. The visit starts at the Ayutthaya Historical Park, a UNESCO world heritage site. 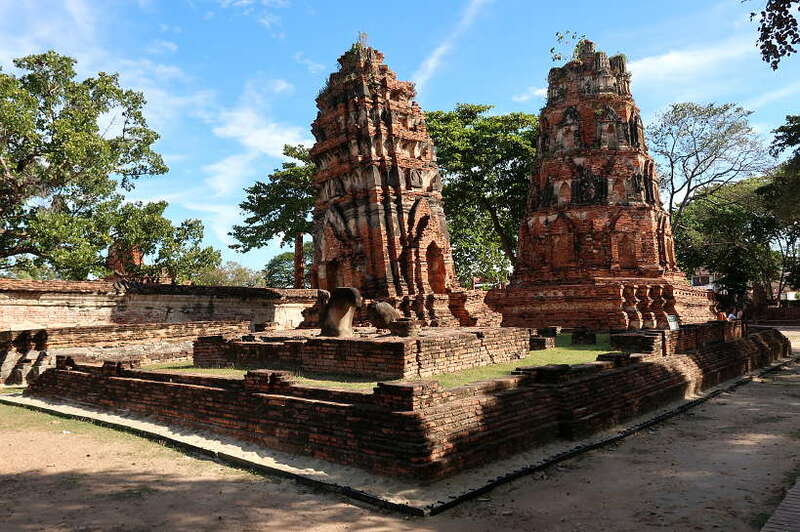 The Ayutthaya temples are rich in history and the site is a beautiful place to explore. There are many magnificent temples to visit in Ayutthaya. 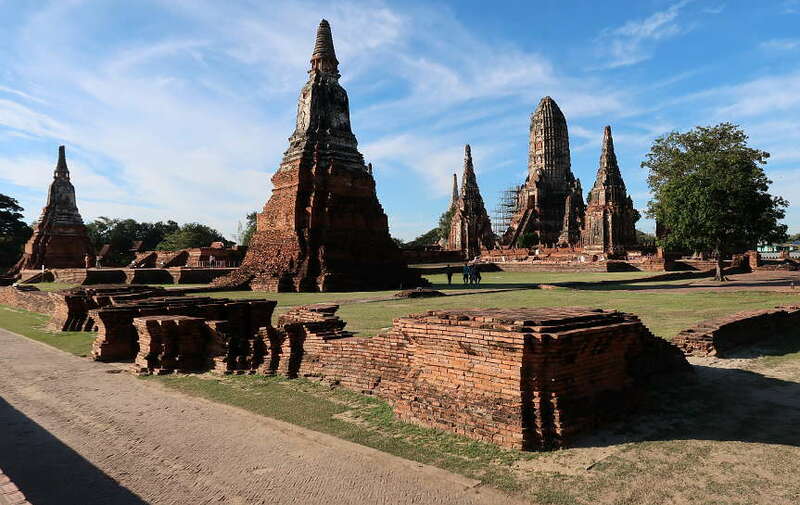 On our Ayutthaya day tour, we visited four main sites within the historical park. Arriving early in the morning at our first royal temple, it was still relatively quiet. Located on the west bank of the Chao Phraya River, the site is filled with majestic structures. The beautiful prang, or Khmer-style tower, reveals a similar Cambodia Angkor Wat architectural design, which was en vogue at the time. The temple was used for religious ceremonies by the royal family now buried on site. Beyond the ruins, the most striking part are the headless Buddha statue images surrounding the temple. Unfortunately, the Buddha images were all destroyed during the Burmese invasion. Wat Chaiwatthanaram is one of the grandest and best known temples in the Ayutthaya Historical Park. This spectacular Wat or temple is located in the center of the city island and is part of the Ayutthaya Unesco World Heritage site. It is home to what is maybe the most photographed site in the park – the Giant Buddha head anchored amongst tree roots. No one knows exactly how the head of the Buddha statue got there. One theory suggests that during the period of ruin, the tree just happened to grow around the head of the Buddha. Non, our guide shared another theory, which claims that a thief may have hidden the head of the Buddha in the tree, only to never return. Due to its proximity to the Grand Palace, Wat Mahathat was one of the most important monasteries of the Ayutthaya kingdom. It is said to have housed the Buddha holy relics. The name, “Wat Mahathat” literally means “Monastery of the Great Relic.” Despite the destruction by the Burmese, you can still see many important monuments at this royal monastery. Wat Phra Si Sanphet is within walking distance from Wat Mahathat. It was a temple used solely by the royal family for ceremonies and storing royal relics. One of the most impressive parts is three bell-shaped stupas lined up on the premises. The stupas actually house ashes of the deceased members of the royal family. In the core of each stupa is a small chamber where the ashes of three Ayutthaya Kings are enshrined. By contrast, next to the ruins is Wat Mongkhon Bophit, a modern temple. On this “active” temple compound, many people visit and worship the Buddha image. This modern temple is best known for its impressive bronze Buddha image, measuring close to 17 meters high (including the 4.5 meters base). Before leaving Ayutthaya, we stopped at Wat Yai Chai Mongkhon located in the Southeastern part of the city. This temple is one of the most colorful of the ancient sites. Statues of Buddhas images encircle the temple draped in yellow robes. The robes, we learned from Non, are changed daily by devotees. Also on the grounds, is one of the largest reclining Buddha images in Ayutthaya. Just like the other Buddha images, this one is draped in a giant yellow robe. While we were there, devotees were placing the robe on the Buddha image and walking around, showing their respects while praying and chanting. To end the temple visits part of our Ayutthaya day tour, we drove to the nearby Ang Thong province. Also located in central Thailand, this small province houses the largest sitting Buddha image in Thailand and possibly in the world. 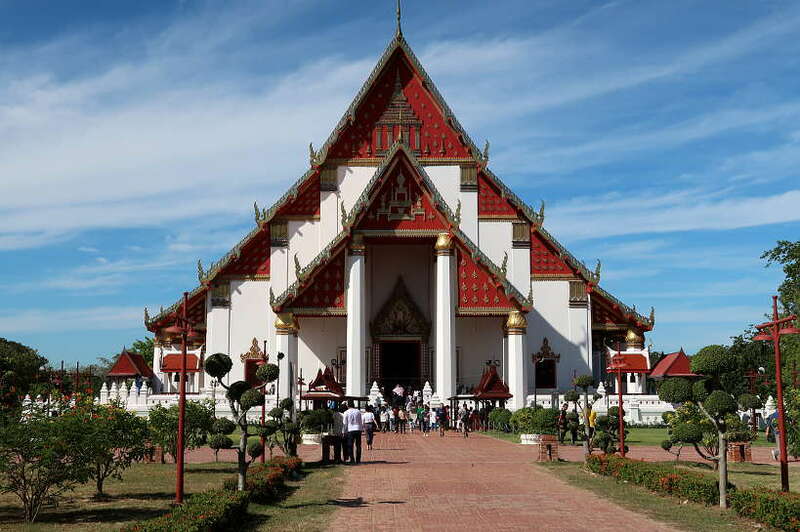 Wat Muang is a lively temple in contrast to the ancient ruins of Ayutthaya. Vendors, ATM machines and local advertising welcome you. On the temple grounds, you find life-size representations Indian epics, striking scenes of the Burmese invasion as well as religious imagery. 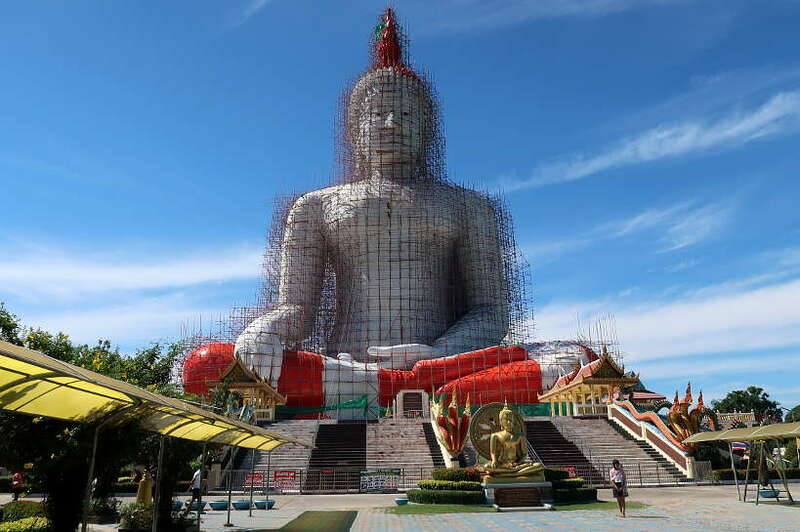 At the time of our visit, the largest sitting Buddha image was undergoing repairs. Despite the scaffolding all around, we could not help but be impressed its magnificent size and scale. Dominating at 84 meters tall, 92 meters including the pedestal, we were awestruck by the enormous statue. On the way to the restaurant for lunch, we stopped at San Chao Rong Thong Market. 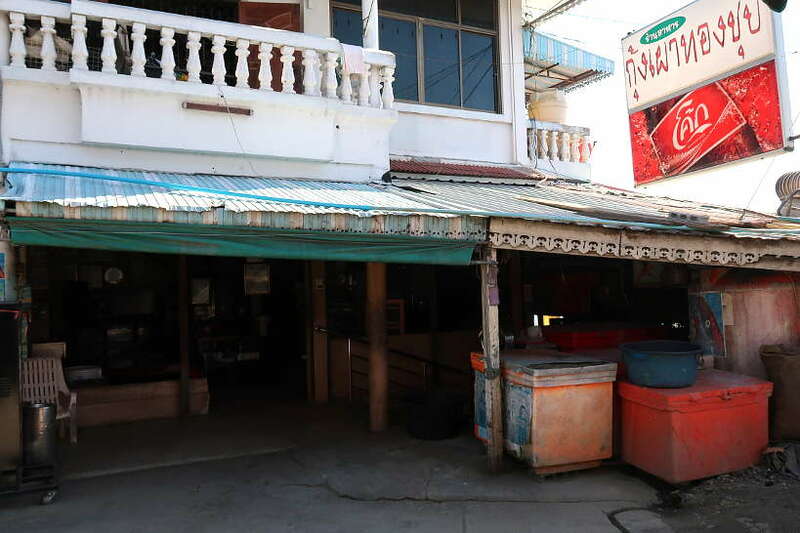 This market is located next to the Noi river in the Ang Thong province, 10 mins from Wat Muang. This area is an old Thai-Chinese community, where Chinese immigrants in the 19th century established themselves along the Noi River. The San Chao Rong Thong Market is an old market, more than 100 years old, and an important market for regional desserts. Many of the desserts are unique to the Ayutthaya region and can only be found at this local market. As we made our way through the winding alleys in the market, Non guided us to a number of Thai-Chinese vendors, selling unique desserts. There were four regional desserts that we particularly appreciated. 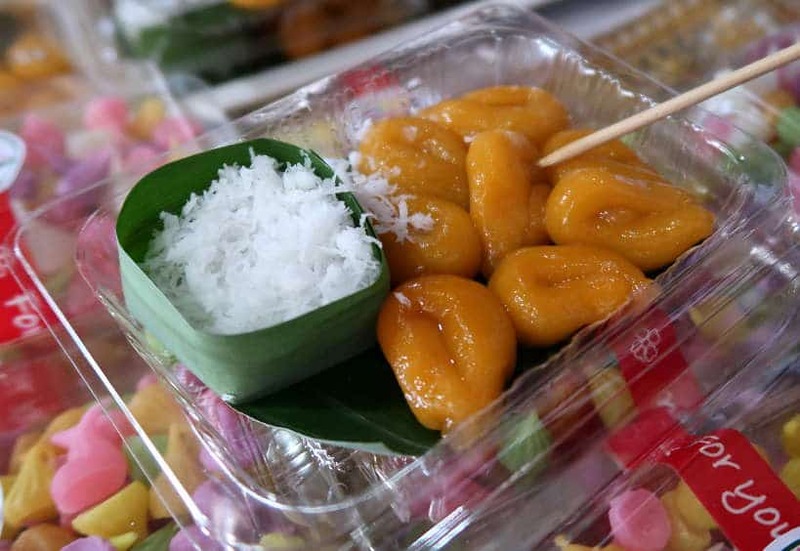 These desserts are unique to the Ayutthaya region and part of our article 15 popular Thai desserts to indulge in. 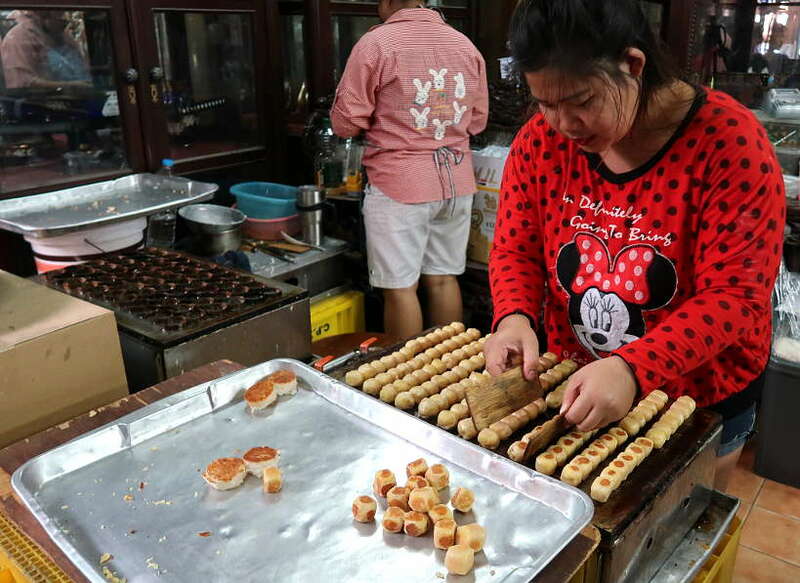 If your travels take you to the San Chao Rong Thong Market, be sure to indulge in the flavors of these unique and unmissable treats. Our first stop was at a stall run by an older lady who is known for her coconut pancakes. 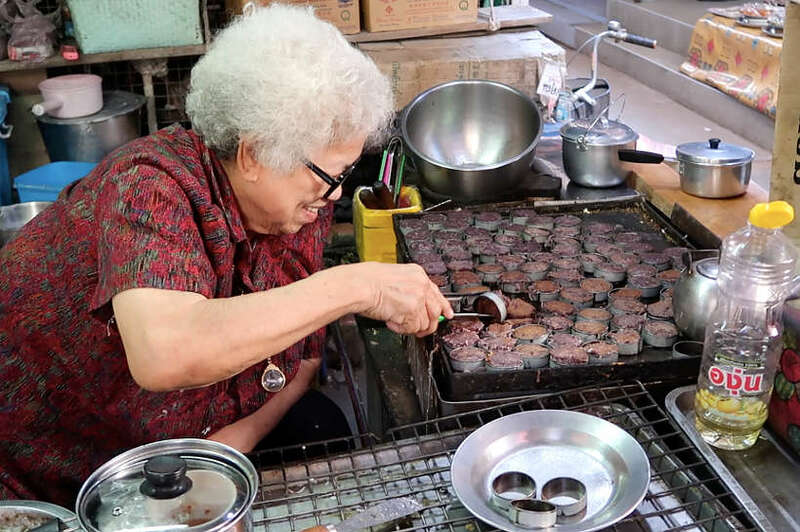 She has been perfecting coconut pancakes for more than 50 years, and according to Non, she is one of the most popular vendors at the market. Prepared with a mix of rice flour and shredded coconut, these small round flat cakes are lightly grilled on a hot griddle. 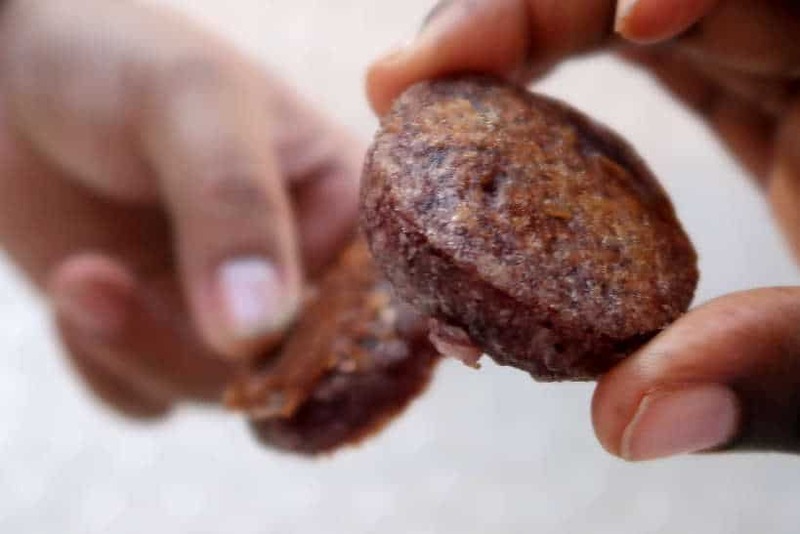 According to Non, the coconut pancakes get their purple color, naturally, from a local flower. At the first bite, the cakes were warm right off the griddle and tasted mildly sweet. The texture is lightly crunchy followed by a softer almost gooey mouth feel. So delectable, in just two bites, we finished the pancakes. We each plunged quickly back into the small plastic bag for more. This was our favorite of the four desserts we had. This particular dessert is only found in the Ang Thong province. It is shredded coconut rolled in a very thin pancake made of rice flour. Made individually, they are sold by eight packs in small plastic containers. This dessert is incredibly light and flavorful. The coconut crackles with each bite while the light delicate flavors of the crepe melts in the mouth. We recommend buying one pack per person, as they disappear quickly and easily. This Thai dessert was one of my favorites at the market. 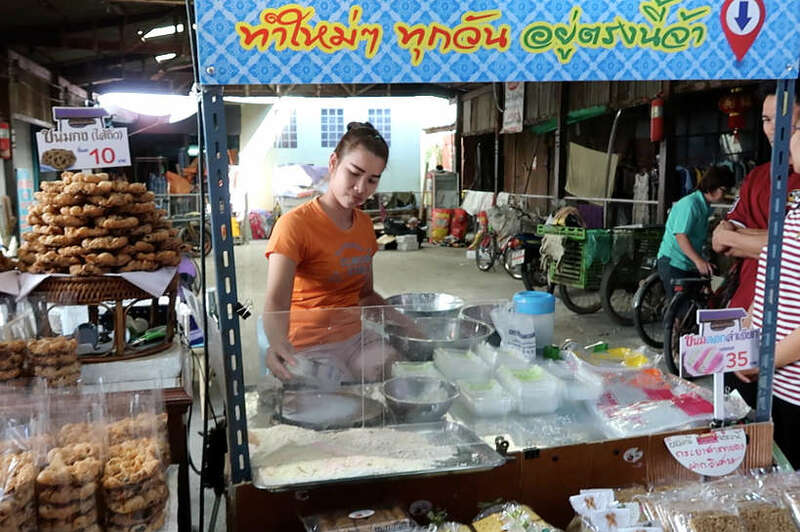 This impressive stall is run by a family that is continuing their grandmother legacy of making these traditional Thai peanut cakes. While at the stall, several regulars stopped by to pick up their treats, reinforcing the popularity of the place. The desserts are cooked on a hot griddle and then turned over to cool down until ready. You can watch the cooling down process at the front of the stall. The small peanut cakes are cut into small cubes, similar to the shape of dice. The dough is made of peanuts, coconut, flour, butter, and eggs. These edible dice are soft with a light peanut flavor. They are not too sweet and a perfect treat for peanut lovers. Further inside one of the alleys, we stumbled onto a beautifully presented stall with a variety of Thai desserts. The smiling vendor, noticing our bags of several Thai treats, invited us to taste her homemade desserts. One of her specialties is the Thai “Fish Egg” dessert. These funny looking desserts are called Thai fish eggs due to their shape and color. This local dessert is made from palm sugar and doesn’t taste at all like fish eggs. To eat this dessert, you dip one “fish egg” into a small container filled with shredded coconut. This dessert has a gooey texture and a light coconut taste. I was not a fan of the texture and Claire liked this dessert more than I did. Although we could have continued eating more desserts, we had to stop so that we could save our appetite for our local lunch. Nevertheless, we carefully packed our remaining treats to have after lunch and on the way back to Bangkok. Eager for lunch and the giant shrimp, we jumped into the car for our last stop on our Ayutthaya day tour. We made our way to Kung Phao Mae Thong Chup restaurant, in Sing Buri Province, our third province for the day. The restaurant was not easy to find. Located at the back of a market, where you have to take steps down to what looks like someone’s personal home, we were thankful to have a guide with us. This local eatery is open and airy with large Thai style windows with no glass. We took our seats overlooking the Chao Phraya River while enjoying the tranquility of the water. The Chao Phraya River is an important waterway for the people of Central Thailand, and for many, their main source of income. 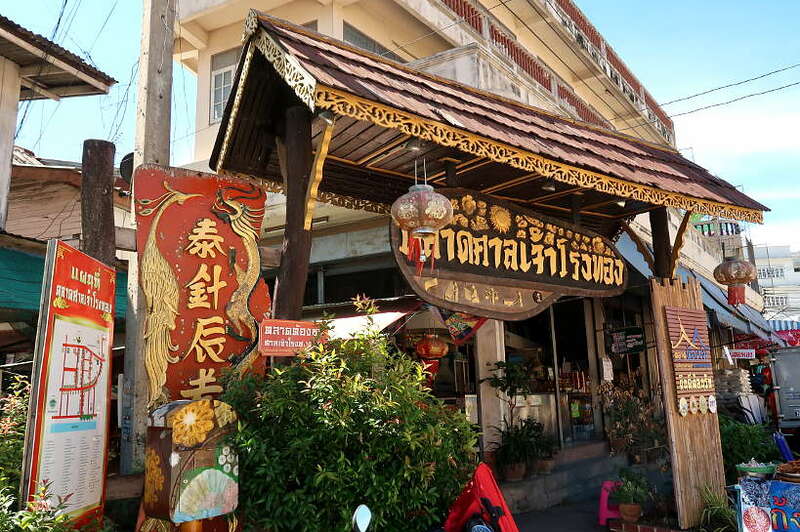 Opened for more than 40 years, this local restaurant is famous for serving traditional Ayutthaya recipes. The main specialty is the melt-in-your-mouth grilled shrimp and accompanying addictive zesty sauce. 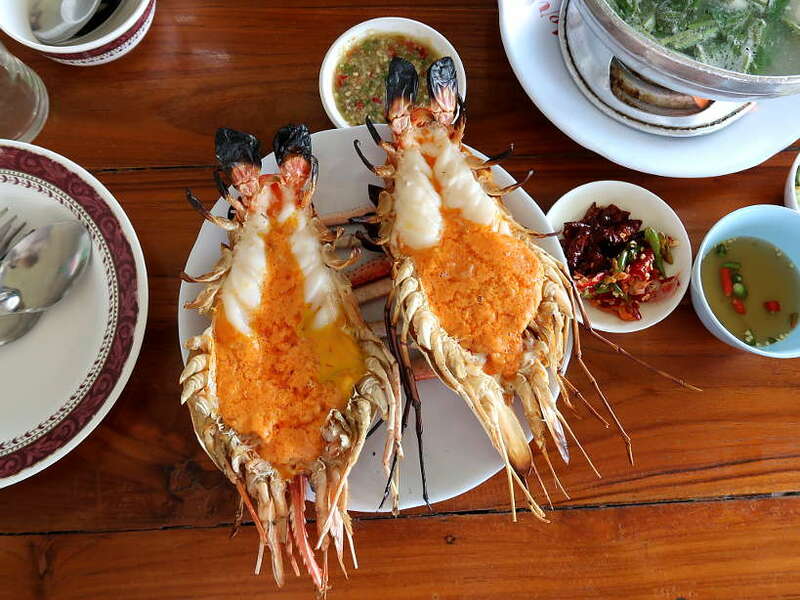 The name of the restaurant in Thai translates roughly to “Mother Thong Chup’s Grilled Shrimp.” Even though Grandma Thong Chup doesn’t cook anymore, the family-owned restaurant continues her legacy of serving the best-grilled shrimp in the region. With Non’s guidance, we ordered a variety of local specialties. In addition to the giant grilled shrimp, we had Tom Yum soup, fish cakes and a young coconut salad with shrimp. Tom Yum soup is one of Thailand’s most popular dishes. It is a type of hot and sour soup packed with herbs, spices, vegetables, and seafood. 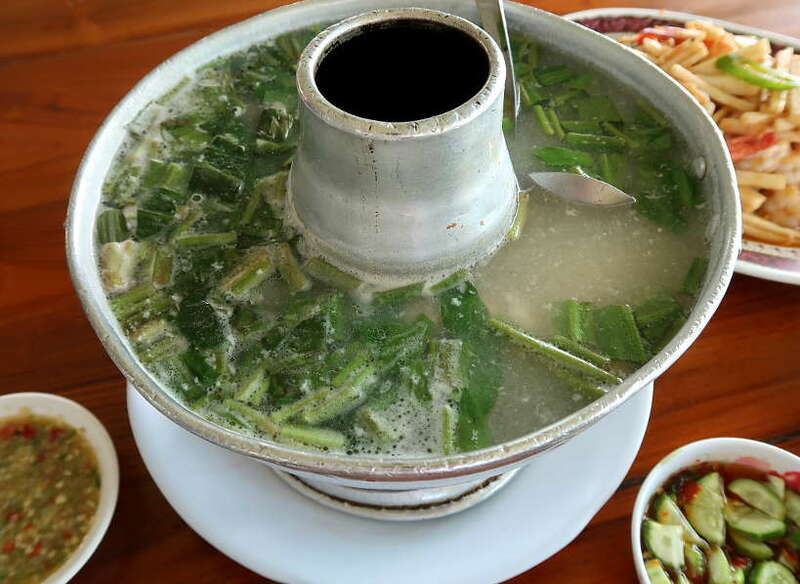 Many say the soup is from Central Thailand where it developed due to an abundance of fresh fish and seafood. The tom yum soup we had included local fish from the Chao Phraya River. The soup was a clear broth with the aromatic flavors of kaffir lime leaves, lemongrass, and galangal, boiled in water with fish, Thai chiles, and lime juice. The full name for this soup is tom yum goong. We really enjoyed the full-flavored broth. The combination of the clear soup and the fleshy fish was the perfect start to a delicious local experience. This was our first time having a young coconut salad and we were both blown away by the flavors and textures. On a plate were thin slices of the edible flesh from young coconuts. These are the same green coconuts used to make coconut water. The coconut flesh was mixed with cucumbers, herbs and Thai chiles in a savory sauce. Together with the fresh shrimp, the flavors were exquisite and surprisingly mild. This salad was very refreshing and one of our favorite dishes of the day. 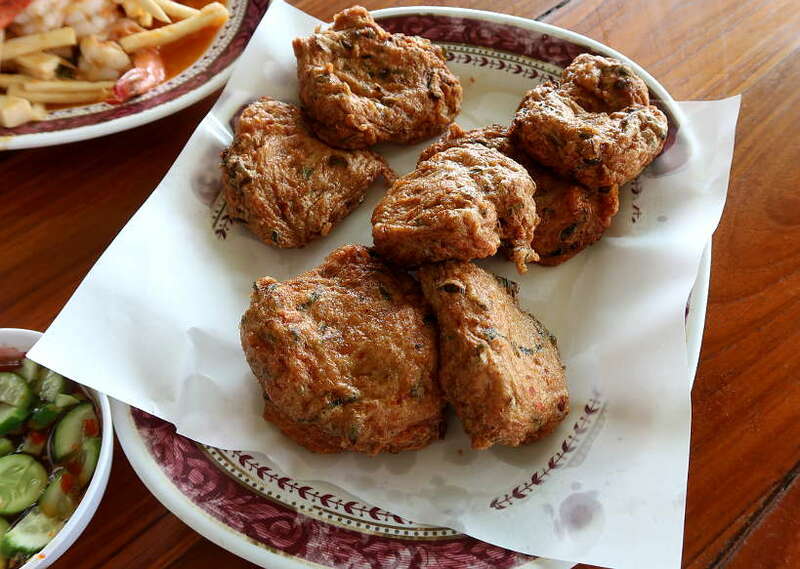 Known locally as Tod Mun Pla, Thai fish cakes can be found throughout the country. They are a popular snack and also eaten as street food. At Kung Phao Mae Thong Chup restaurant, the fish cakes are made using a local fish from the Chao Phraya River. Unlike Western fish cakes, Thai fish cakes are not battered, allowing more of the fresh taste of the fish, spices, and herbs to come through. The fish cakes were soft, slightly spongy and light in texture. The taste was not fishy and when combined with the accompanying Thai sweet chili sauce, the experience was delightful. The giant shrimp were the last items to come to the table and we could not believe their size when we first saw them. On a plate were two of the biggest shrimp we’ve ever seen. Each giant shrimp was cut in half, imagine each half the size of your palm. The giant shrimp were perfectly grilled and cut open in a butterfly style to reveal an opaque white interior and orange colored head oil, melting like butter. The giant shrimp were incredibly luscious and sweet. The meat was firm and fleshy and full of flavor. The accompanying dipping sauce made with Thai chiles and fish sauce enhances the savory flavors even more. We were quite amazed by the incredible flavors. The giant shrimp exceeded our expectations. After a full day in Ayutthaya, getting immersed in the history and local food culture, we got back to Bangkok at about 5:00 pm. 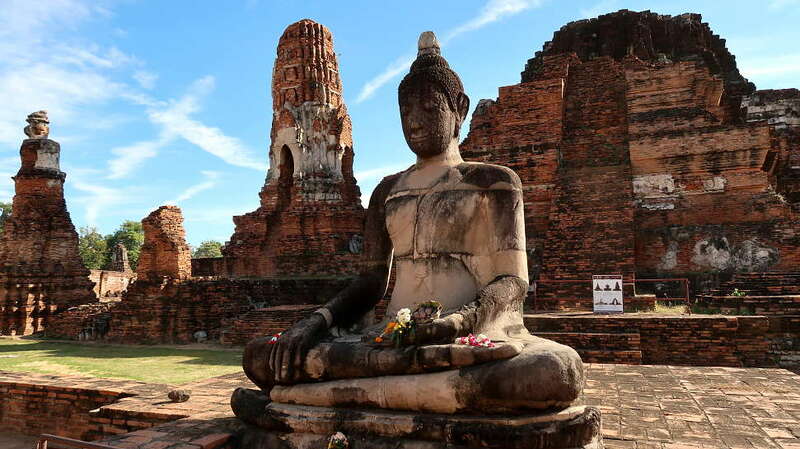 We enjoyed our Ayutthaya day trip and highly recommend the experience. If you are looking to see a different side of Thailand, a day trip from Bangkok to this UNESCO World Heritage Site will enrich your travel experience. To guide you through Ayutthaya, book a tour on the TakeMeTour website. You can count on a fun experience with a local guide who will not only share cultural and historical facts but also introduce you to local Ayutthaya food specialties. 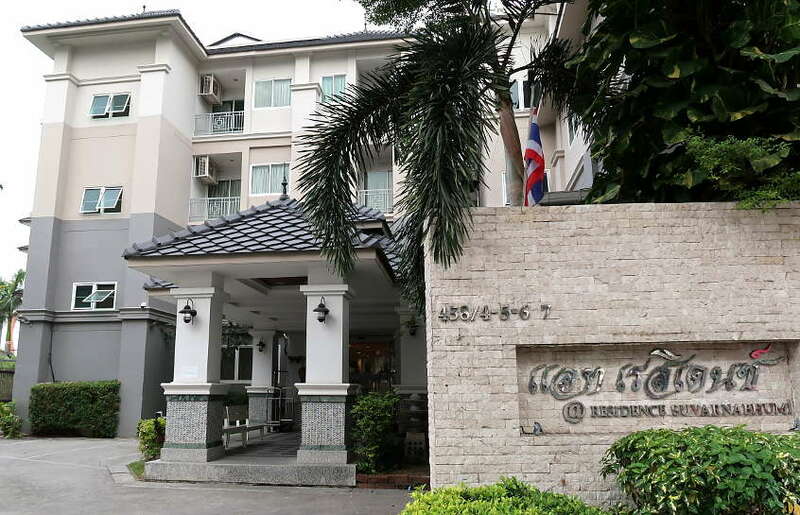 On this particular trip to Bangkok, we stayed At Residence Suvarnabhumi, only about 10 minutes away from Suvarnabhumi International Airport (BKK). If you are arriving or leaving from Bangkok at the early hours of the morning, you can’t beat the proximity to the airport. At Residence Suvarnabhumi offers an airport shuttle service which is quite convenient after long haul flights. The Residence has comfortable rooms, free Wi-Fi, an on-site gym and laundry services. We took advantage of the breakfast offered, which was perfect for our jet-lagged mornings. Right around the corner from the residence is a Thai local market and The Paseo Mall. If you would like to search for more hotel options in Bangkok, click here to get started. Once you arrive in Bangkok, getting online and having access to Wi-Fi will make your life easier. This will be especially helpful when coordinating your pick up with At Residence Suvarnabhumi, using Google Maps to get around or to simply connect online. 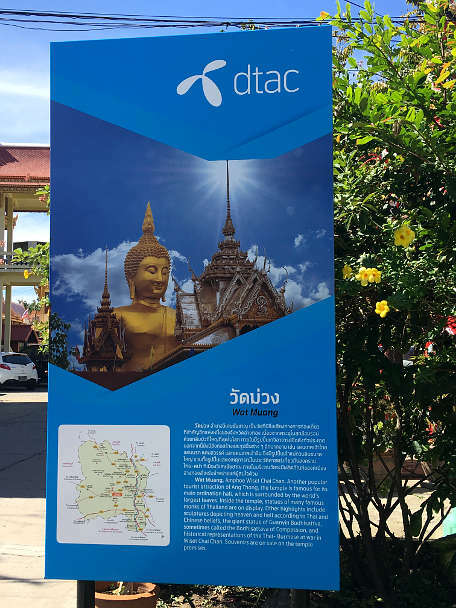 We got Thailand’s popular dtac SIM card for travelers. We got started with the 8-day unlimited internet dtac SIM card, though you’ll also find options for 1-day, all the way to 15 -days. Click here to order your dtac SIM Card and pick it up at any dtac booth at the airport. Special thanks to Tourism Authority of Thailand and TakeMeTour for hosting our Local Table Ayutthaya day tour. We also thank their partners, At Residence Suvarnabhumi and dtac. All views and opinions expressed are our own. Full bellies and happy taste buds too. This all looks so incredible. I bet I could eat 12 peanut cakes! Is it fair to say that I can always tell Thai cityscapes and buildings because of how pointed they are? Something about thai architecture stands alone in its shape. There are always pointed spires, details and everything looks bejeweled. And I’m with you- i hate guided tours with everyone crammed in a bus. The last one I took was to the grand canyon and as a vegetarian I had a hard time eating on the tour because they provided lunch, but all i got was half a salad and an apple and had to pay for my own drink, where my hub got a full deli sandwich, chips, carrots and a cookie. then it was to in and out burger because it’s so touristy and once again i had no real options! I hate tours, i’d rather just do it all myself. Thanks, Kate for your feedback. Taking a personal tour is really the better option than tours like the Grand Canyon one you describe! 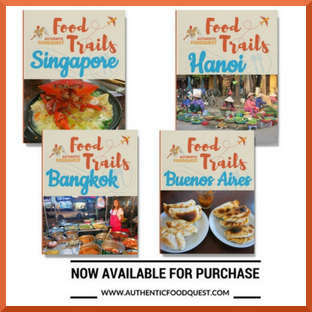 If your travels take you to Thailand, definitively consider this experience both for the history and culture as well as the amazing local food. Indeed, it’s easy to eat the peanut cakes. Delicious!! What an amazing trip!! My daughter has been to Thailand, but I never have. It looks gorgeous and I love the food! Did your daughter enjoy her time in Thailand, Pam? 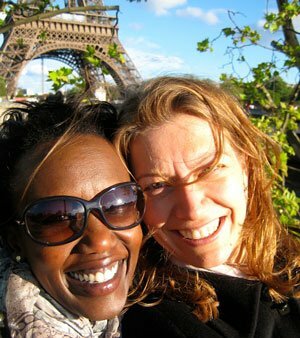 Plan a trip with her or with friends and discover the wonderful Land of Smiles. Thailand has so much good food to offer 🙂 Hope you get there soon. Thanks for stopping by. This looks amazing, I wish we would have seen this before we went to Thailand 2 years ago. Something I will definitely save for a future trip! That’s great to hear Shelbi that you enjoyed the article. It took us a while to get to Ayutthaya as well and we are so glad we finally had the chance to visit the region. Definitively recommend the experience on your next Thailand trip. San Chao Rong Thong Market looks amazing. I love those coconut candies. So easy to devour an entire packet of them. But let’s be honest it’s those GIANT SHRIMP that got me excited. They look delish. Lol…Jean. All the sweets at the local market were incredible. The giant shrimp was amazing and it was a really fun day trip from Bangkok. Highly recommend the experience on your next Thailand trip. Thanks for stopping by! Wow!!! You made me want to go back to Ayutthaya. I missed out on all the food markets and the giant shrimp! That’s a bummer to hear that Geena. It sounds like another trip to Ayutthaya should be on the agenda 🙂 Thanks for stopping by! I’ve yet to visit Thailand and Ayutthaya sounds like a great place to visit! Can’t wait to try those Thai pancakes. They look yummy! So glad you enjoyed reading about the Thai desserts and the pancakes in particular. These were some of my favorite and worthy of a trip to Ayutthaya 🙂 Thanks, Brittany. OMG! That shrimp looks incredible! Looks like an amazing and unique tour. I saw the Buddha head in the tree years ago, but it was on a big tour with hordes of people, so I missed the other nearby attractions. I hate those types of tours, but it was my first trip and I made mistakes. I really want to go back to Thailand and have a more intimate experience. Thanks, Nat for sharing your experience at Ayutthaya. It is definitively worth going back for a more intimate experience. For your next trip, simply book a tour with a local guide and plan for an amazing time. Appreciate you stopping by! Wow! It seems like you covered a lot of things to do in just one day tour. I love Thai food that why I’m kinda jealous seeing you both indulging those delicious treats. I’m interested to try the purple coconut pancake. Yum! 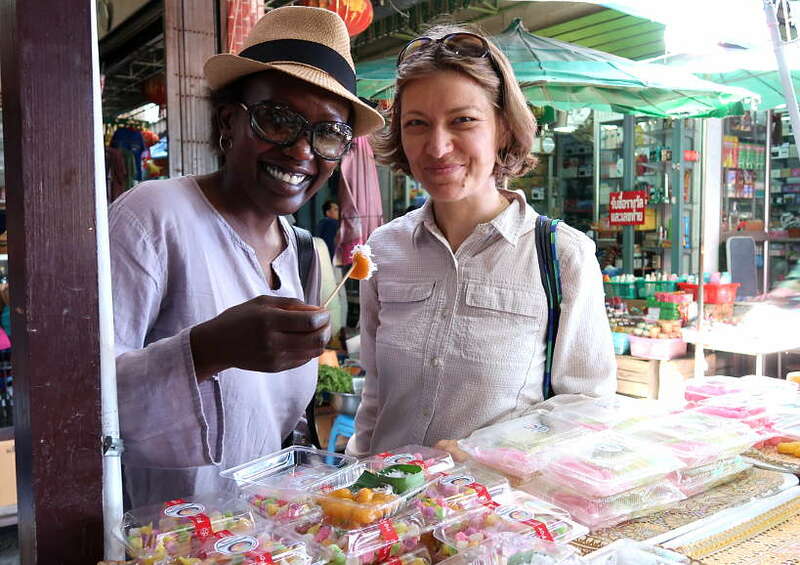 Appreciate the feedback Joy, it was truly a fun experience getting to see Ayutthaya and discovering the local specialties. A great tour and experience, one we highly recommend 🙂 Thanks for stopping by. My mouth is watering from all that amazing food. 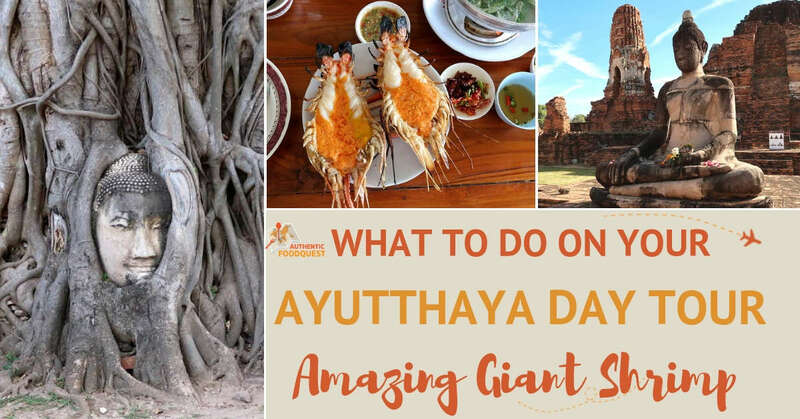 We’ve been to Ayutthaya but never to the dessert market, or eaten the giant shrimp. We miss Thai food so much! Thanks for stopping by. That’s a bummer you missed out on the local specialties on your Ayutthaya trip. Perhaps a new reason to go back 🙂 Cheers. You are right, Thai cuisine is really flavorful and it varies so much by region. So glad this article took you back to a wonderful time. Thanks for stopping by Sarah! You had me at “giant shrimp.” I’m obsessed with your blog. I love food and especially if it’s unique to the area. Those little coconut pancakes look delectable! Thank you so much Kylee for your feedback on our website. 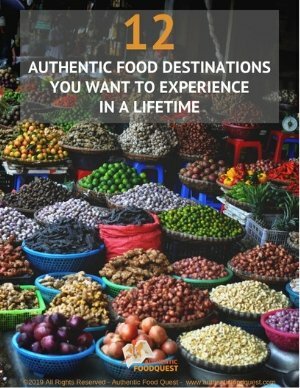 Traveling through the local food specialties is a unique and rewarding way to experience a destination. All the treats were divine, worthy an experience. Hope you get to Ayutthaya soon. Cheers. So glad you enjoyed the article Michele. Ayutthaya has so much to offer in terms of history, culture and food. A wonderful experience and one we recommend highly. The shrimp were incredible and quite tasty, too:) Thanks for stopping by. Wow! This is so interesting! I’ve visited Thailand but not Ayutthaya. I’d love to incorporate Ayutthaya on our next visit. There are so many interesting statues, temples, Buddha head, markets… I love it all! Your video is so well made! Really enjoyed watching it. Thank you Jyoti, for your feedback on our Ayutthaya experience and video. If you are planning a trip back to Thailand, definitively recommend a day trip to Ayutthaya…you will have an amazing time. Thanks again! I wasn’t able to visit this part of Thailand, but I’d love to at some point. How great to get such and awesome and authentic tour. I really want to try the Thai Peanut Cakes! Thanks Vicky, since you’ve been to Thailand already, a trip to the ancient capital is another way to enrich your experience. And yes, the Thai peanut cakes were quite easy to eat and so small…making it extremely easy to eat several at one time. Thanks for stopping by. I have not been to Thailand but I would love to go with you as my guide! What a great story and photos. Ayutthaya park would be my first stop to get pictures of that beautiful scenery and add a new UNESCO site to my list. The buddhas in the robes is incredible. That shot is magazine-print worthy. Thank you so much Melody. That is really a high compliment that we truly appreciate. We’d be happy to show you around and lead you to all the best eateries. Appreciate the feedback about the shot of the buddha images in robes. We’d be thrilled to share our experience and images in magazines (2019 project). Thanks for the feedback and glad you enjoyed the article. 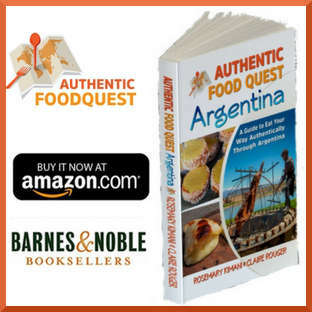 History and food are very important to me when I travel and I love that this tour combines both and that it is a smaller tour, as I’m not into going on a tour with a huge busload of people. I want to try all of the food, especially the coconut pancake and giant shrimp! I haven’t been to Thailand yet, and a tour with a local would be a great way to experience the local sights and foods. Saving! Thank you Lara and so glad you enjoyed the article. If you like local and intimate experiences, then having a local guide with you will you have a deeper appreciation for the place. Hope you make it to Thailand soon. Thanks for stopping by. Ayutthaya is a beautiful place a few hours away from Bangkok. I totally agree how important it is to visit the ancient capital. I love how you have summarized the important places to visit in ayodhya close-up I have already been there last year and my favorite is Wat Mahathat. So glad you enjoyed the article Shreya. AS someone who has been there, you can truly appreciate the history and beauty of the place. All the Wat’s were so different and it’s hard to find a favorite. However, the food – the giant river prawns and the market visits were highlights. Thanks for stopping by. We missed Ayutthaya when we were in Bangkok. The thought of a giant shrimp tour would get me salivating too. But it looks like you had lots of other food treats too. But the temples are also a good reason to visit Ayutthaya. The former Royal Palace looks like an interesting spot. But the Big Buddha would draw me on. We will certainly look at TakeMeTour when we visit Thailand next. You would love a TakeMeTour on your next Bangkok trip. You’ll get personalized service, an amazing local guide and the history to fully appreciate the significance of Ayutthaya. And all of this will end with a delicious visit to the market and the most amazing giant prawns you’ve ever had. Highly recommend on your next Thailand trip. Cheers, Linda. I visited Ayutthaya a few years ago and was impressed at the historic treasures you could see there. I didn’t get time to taste the local food though. It looks like a missed out on an opportunity. We’ve never heard of Ayutthaya, but then we have never visited Thailand neither. 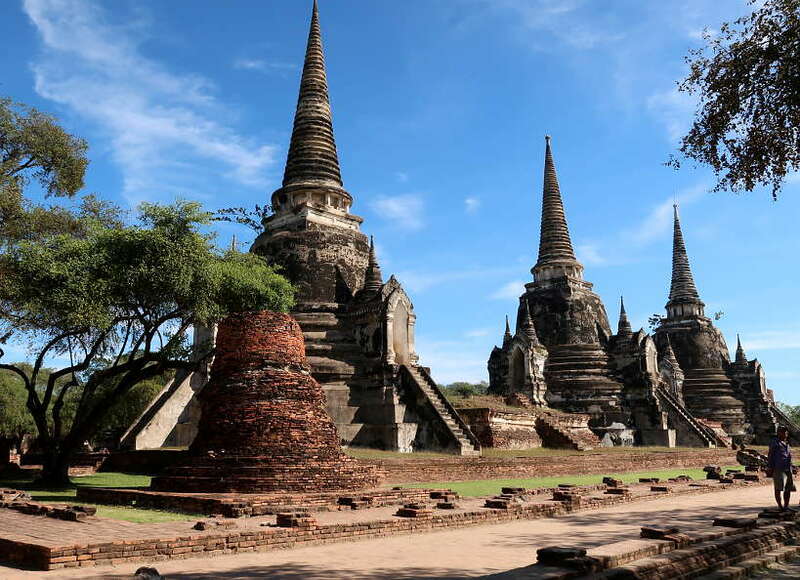 It’s on our bucket list though, and little by little we’re now making a list of lesser-known places in Thailand and especially archaeological sites; Ayutthaya will certainly be added! Not only for its ancient temples and spectacular ruins (the Buddha head in the tree is really breathtaking! ), but also for Thai food! 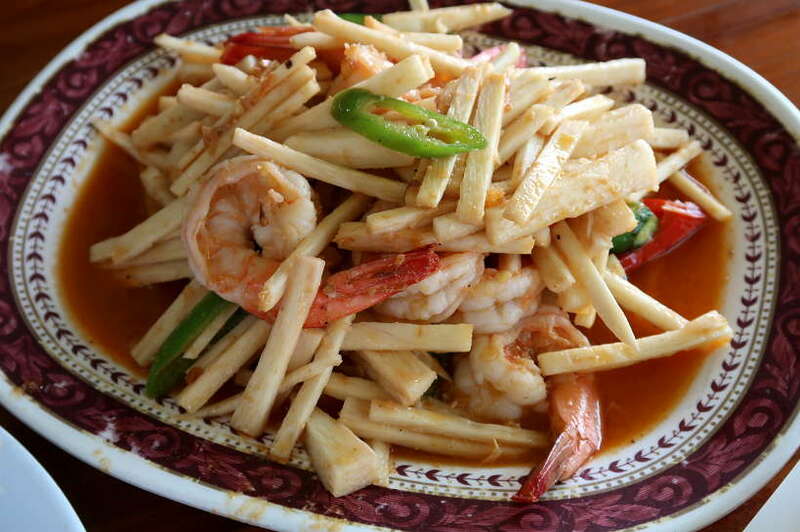 The giant shrimps look absolutely delicious, and then there’s Tom Yum Goong and all the spicy salads that we love! Thanks for sharing this inspiring post! Thank you so much Mei and Kerstin. So glad you enjoyed the article. Visiting the ancient capital of Ayutthaya is an amazing experience. The history and the food are two very good reasons to visit. Hope you get to Thailand soon. Thanks for stopping by. I absolutely love Thai food and can only imagine what an amazing experience it must have been to take a food tour in an ancient Thai city. I have never been to Ayutthaya but the temple, the giant Buddha and the markets look amazing. The coconut pancakes must be s delicious and the giant grilled shrimp looks yummy too! Thanks Medha, a trip to Ayutthaya is well worth the experience. The food, culture, and history are all good reasons to visit. 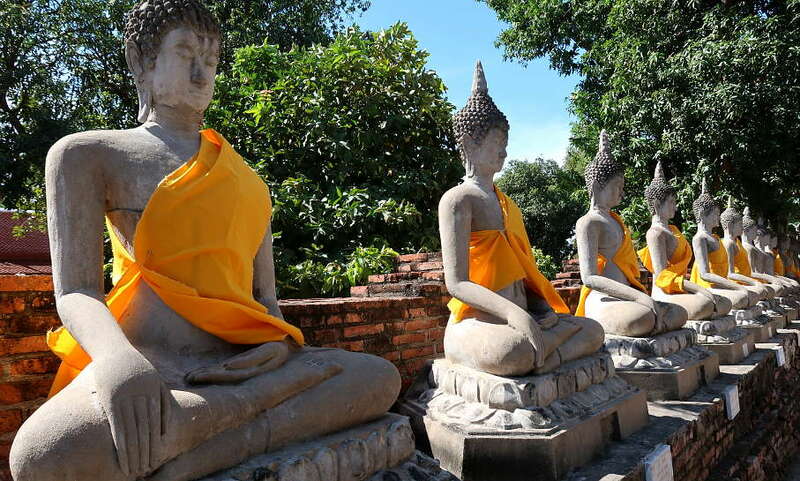 When you do make it to Thailand next, book a trip to Ayutthaya for a fascinating experience. While I visited all the Wats you mentioned here I missed out on the food scene. I wish I had tried those desserts being devoured so lovingly by all for years. I am sure they must be tasty to last this long. The shrimps are tempting too. The food scene was a highlight and a delicious part of the experience after seeing all the Wat’s. Be sure to check out the local markets and indulge in the giant river prawns/ shrimp which are a local delicacy. Hope you get back to Ayutthaya soon. Thanks, Indrani. Those Thai fish cakes look delish! 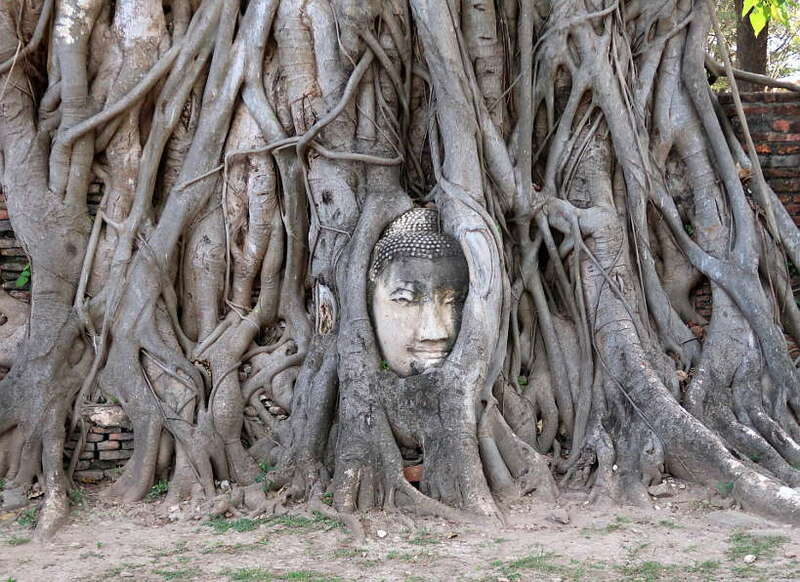 And I can’t believe the Buddha head within the tree roots or that no one knows the origin of how it came to be. There’s clearly an incredible amount of history and culture in Ayutthaya. Great to hear you enjoyed the fascinating story of the Buddha head in the tree. Indeed, so much history in Ayutthaya. Definitively worth visiting if your travels take you to Thailand. Thanks, Kate. I am a huge lover of Shrimps! That giant freshwater shrimp is so new to my eyes, never tried that as well. I love how the tour from Non is, going beyond those amazing places and tasted different delicacies. It’s also so tempting that purple cake one that you had it in two bites and gone, I want that! Thank you, Ferna for your kind words. The purple cakes and actually all the desserts in Ayutthaya were pretty spectacular. The giant freshwater prawns were quite amazing as well. 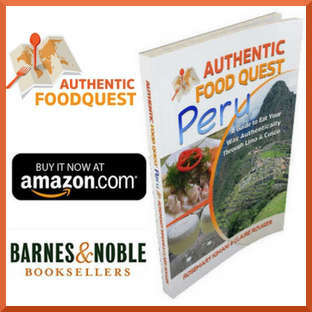 It helps to travel with a local guide to understand the local history and discover the local food specialties. Geez, that shrimp was HUGE. The food on your tour looked so delish. Aside from the food (which I am sure was extra), how much did this day tour cost? And what did it include? Actually, Mike, everything was inclusive and part of the tour. Simply click on the link in the article to get all the details. A pretty amazing day trip from Bangkok. Cheers.